Meet the HTC U12+, an Android smartphone with an elegant see through design, dual cameras both on the front, and a powerful Snapdragon 845 processor. The new flagship is the successor to the HTC U11+, and not the direct successor to the HTC U11. The HTC has thankfully resisted the urge to add a notch to the U12+ allowing it to stand out in the 2018 flagship landscape. Despite being narrower than the recently announced OnePlus 6, the U12+ is pretty tall, while being thicker and heavier than the average in its category. The handset is powered by Qualcomm's Snapdragon 845 processor with 6GB of RAM. You get to pick between the 64GB and 128GB storage options based on your need. HTC has packed a massive 3500mAh battery into the U12+ and you should get a solid day of use out of the handset. You also get a fast charging option in case you run out of power. However we cant help but wonder how much more HTC would have been able to churn out of this battery had they gone for a 1080p screen instead of the WQHD which reduces the endurance of the battery. The U12+ comes in three colors - Translucent Blue, Ceramic Black, and Flame Red. 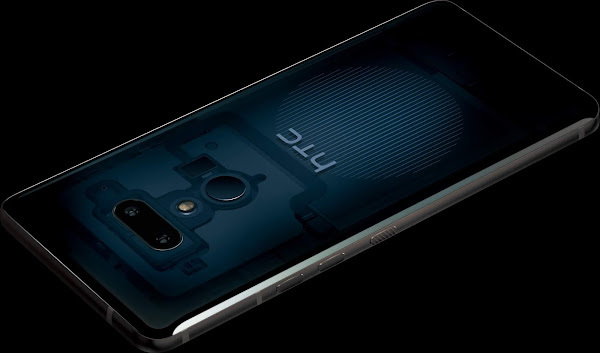 The mirror glass coating used for the casing is something HTC is calling Liquid Surface, which showcases the phone's internals through the casing. 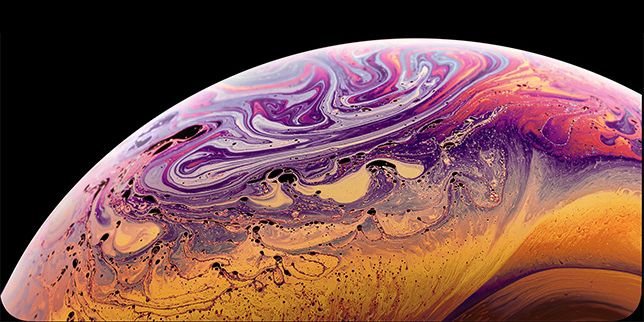 The handsets also sport IP68 water-resistance to protect your expensive device from accidental spills. The handset comes with very thin bezels all around, but still allows comfortable navigation. You will find a fingerprint scanner on the back of the device, while the camera is ergonomically placed to avoid accidental finger placement when holding your phone sideways. 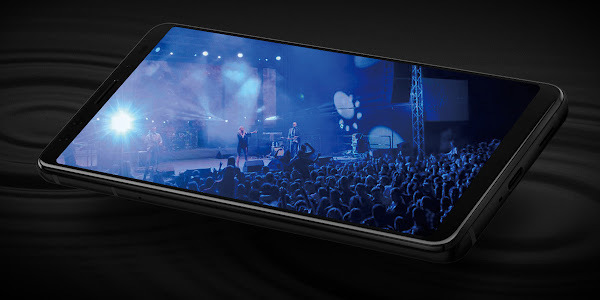 The HTC U12+ features a 6 inch QHD (1440x2880 pixel resolution) display with an 18:9 aspect ratio. The screen increases on the standard color gamut, supporting "wide color" DCI-P3 images. You also get HDR10 video playback like most major flagships today. The HTC U12+ features a dual-camera setup both in the back and on its front. On its rear you get a 12MP optically-stabilized camera with a 1.4 micron pixel lens, alongside a secondary 16MP telephoto lens for 2x magnification. The main camera is capable of capturing HDR10 video, and has an ultrafast whole-sensor phase detection autofocus, aided by laser autofocus. You can also capture 4K video at 60fps, as well as slow-motion at 240fps. On the front you have two 8MP wide-angle lens cameras for selfies or video calls. Besides giving better portrait shots, the front cameras also support face unlock. You additionally get features like screen flash, AR stickers and HDR Boost. HTC's camera setup is bound to produce excellent results, and we expect some of the best output of photos and video from this device. The U12+ currently has the highest DxO Mark score for a dual camera phone, showing the company knows what its doing. The HTC U12+ comes packed for audiophiles with stereo speakers, along with a separate woofer and tweeter. There are four microphones for noise cancellation and surround sound recording, scattered strategically around the body of the phone. Those surround mics mean that HTC's Sonic Zoom is here again, allowing you to focus on a particular source of sound or voice in a video, with louder and clearer results than before, while the Audio Boost feature gives extra strength to the "3D audio" recording for some pretty stellar sound to go with your pretty 4K footage. The HTC U12+ comes with Android 8.0 Oreo out of the box, and we expect HTC will skip Android 8.1 and focus on bringing the Android 9.0 update sooner. HTC's Sense UI will sit on top of Android, with its minimalistic customizations and a few HTC apps. HTC has however added some gesture based navigations to the interface, including allows users to swipe from right to left to access quick settings. HTC is known for letting its customers physically interact with the device frame, and its no different with the U12+ flagship. With the company's new Edge Sense 2, you will be able to squeeze the handset with variable force to interact with it. 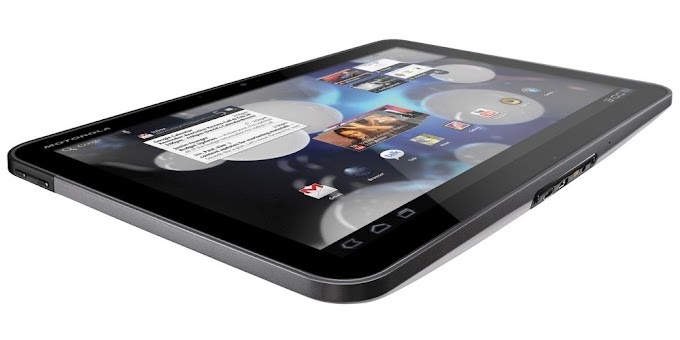 HTC has also introduced double-tapping to the mix. Edge Sense 2 will be able to tell which hand you are grabbing your phone with an adjust accordingly. Double-Tapping instead of using the virtual back key for example, will carry out the same action. This is extremely useful on a large screen device like the U12+ avoiding the user having to stretch their thumb across the screen. Additionally, by simply holding your phone, the device identifies that you are interacting with it, and wont auto-rotate or dim the display. This helps avoid the frustration of having the display flip or dim out when you are reading in bed. 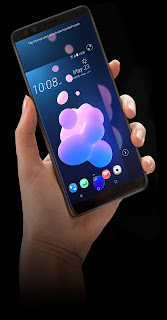 HTC states that you can map and adjust each and every interaction with the phone by using the three pillars of Edge Sense 2 - squeezing, tapping and holding. These gestures will work with most apps on the Google Play Store, and are not restricted to stock applications. You can get the 64GB model in either color for $799 while the 128GB model is priced $849. Would you consider picking up an HTC U12+ over a device like the Samsung Galaxy S9 or the LG G7 ? Leave your picks in the comments section below.